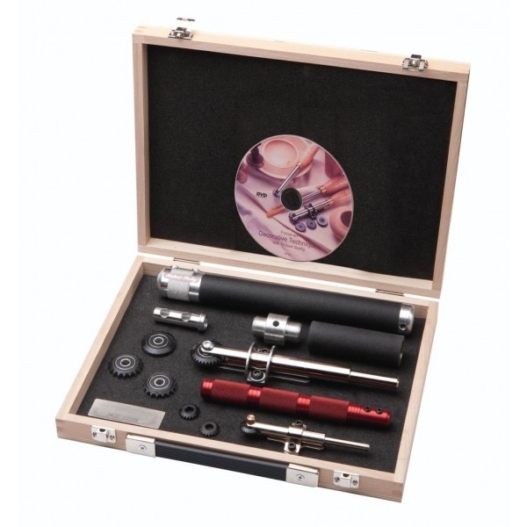 For decorative woodturning this set is an absolute must. Featuring the full size and modular micro systems, these tools with their varied cutters will deliver a multitude of decorative shapes and patterns on both large and small projects. See the latest spiralling and texturing techniques with world renowned turner Nick Agar on the set DVD. Nick reveals just a few trade secrets when unleashing the creative power of these tools. ” Unhandled Spiralling System (330S) – the first and still the number one texturing tool available. ” Cutter at 2mm pitch (350/2). ” Cutter at 4mm pitch (350/04). ” Cutter at 6mm pitch (350/06). ” Unhandled Modular Micro Spiralling Tool (370/0) – popular micro version of the its full size stable mate. ” Fine spiral cutter (370/01). ” Medium spiral cutter (370/02). ” Sovereign 12″ handle (SOV-12) – with Softex grip handle. ” Sovereign 4″ extension – handy addition to increase handle size to 17″. ” Sovereign Threaded Coupler (SOV-TC) – joins handles together to customise lengths. ” Diamond honing stone (DS 600) – 1″ X 3″ 600 grit.